Ann Arbor has its first must-see musical of the season — and it is brought to you by way of Ann Arbor Civic Theatre and their production of GREY GARDENS at the Arthur Miller Theater at the University of Michigan. In a mesmerizing star-turn as Edith Beale/Little Edie Kathy Waugh turns on the charm and vocal highlights necessary for this very difficult dual-role and it is spectacular. You can’t keep your eyes off of her. Matching her blow-for-blow in Act II, Laurie Atwood plays the now-aged Edith Beale with both humor and pity so essential to this piece. Under the direction of Edmond Reynolds, the remainder of the cast is generally strong — Thalia Schramm as Young Little Edie is particularly good; Sebastian Gerstner both charming and catty as George Gould Strong, and Charles Sutherland steady and able as Major Bouvier. The rest of the cast is comprised of Christopher Joseph (as Brooks Sr and Jr); Maeve Donovan and Audrey Wright as the Bouvier children; and Kevin Douglas Jr as Joe Kennedy and Jerry. A true standout here is the superb orchestra work, under the direction of Tyler Driskill and a virtual who’s-who of Ann Arbor musicians in the 11-piece ensemble. It’s one of the strongest orchestras I have heard locally for a musical, professional or otherwise. There is the rare stumble that reminds you that this is not professional theater — Leo Babcock’s well-designed set is sloppily painted; there are a few light cues that take a bit too long; and the costume design is hit-and-miss, especially a particularly glaring gaff in Young Edie’s engagement dress, which my theater partner last night turned to me and said “should be burned immediately”. There are other things that make you sit back in surprise that this is indeed community theater: the lighting design by Tiff Crutchfield is sharp and the use of the haze system to make the light beams pop at the beginning of Act II something you rarely see at the amateur level; the sound design by Bob Skon is exceptional. The set dressings and props by Brenda Casher and Martha Montoye are spot-on. Stephanie Buck and Heather Wing supply beautiful wigs and hairstyles; and Rachel Francisco’s choreography is fun and character-driven. But that brings me back to Kathy Waugh. Go see this show. 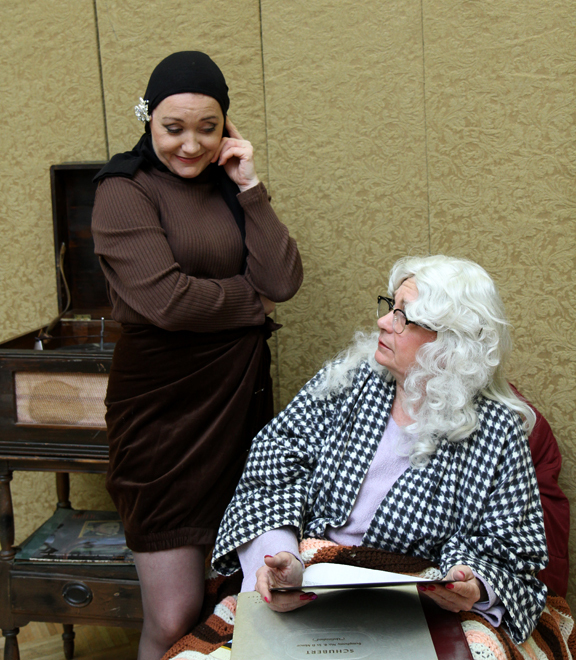 GREY GARDENS continues at the Arthur Miller Theater on North Campus through Sunday March 11th. Tickets are available at a2ct.org. As with all shows at the Arthur Miller, let this serve as warning: parking is not plentiful and there is a parking charge. Get there early, as seating is general admission, but mostly because parking is not sufficient and you might have a long walk to the theater from elsewhere on North Campus if the lot is full by the time you arrive.